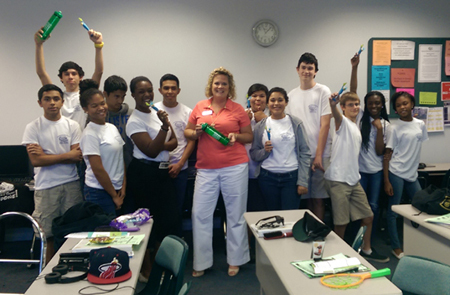 Courtney Moyett, the Tobacco Prveention Specialist in Okeechobee County, had the opportunity to speak to a youthy group attending the Expanding Horizons Summer Camp on July 23, 2014. This summer camp is for local Okeechobee teens ages 14-16, and is sponsored by the Okeechobee County School Board and Children’s Services Council. The camp is hosted on the Indian River State College campus. Fourteen students and two instructors from the local Okeechobee County Schools attended the presentation. The students were educated on the negative effects of tobacco, how tobacco can harm their bodies, and what they can do locally to help bring awareness to their peers. After hearing the presentation, many of the students stated that they were interested in joining their local Students Working Against Tobacco (SWAT) clubs, and were excited to share what they learned with their family members who are current tobacco users. For more information on the tobacoc prevention programs in Okeechobee County, including the local SWAT clubs, contact Courtney Moyett at cmoyett@quitdoc.com.